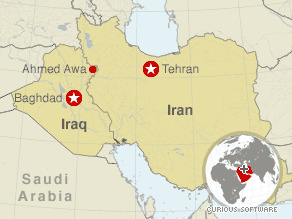 (CNN) -- They are four American friends and seasoned travelers who were hiking through Iraq's Kurdistan region before three of them crossed the unmarked border with Iran, where they were detained by Iranian authorities. Ahmed Awa, on the border of Iraq and Iran, is where police saw and warned the American hikers Friday. Kurdish officials identified the detained hikers as Shane Bauer, Sarah Shourd and Joshua Fattal, CNN confirmed Sunday. The fourth hiker, Shon Meckfessel, stayed behind in Iraq. "My husband and I are eager for the best welfare and conditions for our son, Josh, and for the other two companions he's with," Laura Fattal of Elkins Park, Pennsylvania, told CNN Radio. "And that is our only concern, his welfare and the best conditions for him." Meckfessel was identified by his grandmother, who told CNN that he stayed behind because he felt sick. Meckfessel is at the U.S. Embassy in Baghdad. "My grandson has asked me not to talk to the media," said the grandmother, Irene Meckfessel of Carmichael, California, before hanging up Saturday. Iran's state-run media reported that Iranian security forces arrested the three Americans Friday for illegally entering the country from Iraq's Kurdistan region and that the matter is under investigation. U.S. State Department officials say the Swiss ambassador to Tehran is seeking information about the case on behalf of Washington. The United States and Iran do not have diplomatic relations and Switzerland represents U.S. diplomatic interests in Iran. Friends of the travelers told CNN that the three who were detained have spent time or have lived in Western Europe and the Middle East. Sandy Close, executive director of the nonprofit Pacific News Service, described Bauer -- a photographer whose material was occasionally posted on her Web site in the past -- as a "gifted linguist and photographer with wanderlust for travel and a student of Arab cultures. He's a remarkably talented guy." Shourd described herself as a "teacher-activist-writer from California currently based in the Middle East" on a profile listed on a travel Web site. Fattal shared his friends' love of travel and learning, and was described as "fiercely intellectual" by his friend, Chris Foraker, who spoke to CNN affiliate KVAL in Eugene, Oregon. Foraker said he met Fattal during a study abroad program in 2003, and the two worked together at the Aprovecho sustainable living research center in Cottage Grove. The four travelers spent the night at the Nirwan Hotel in Sulaimaniya on Thursday, said Mudhafer Mohammed, the owner of the hotel. Bauer, Shourd and Fattal left early Friday in a taxi for Ahmed Awa, a Kurdish town near Iraq's border with Iran, planning to hike in the mountains there, according to Peshrow Ahmed, spokesman for the security manager of Sulaimaniya. Ahmed Awa police spotted the hikers at one point Friday, Ahmed said, and warned them that they were near the border with Iran -- which is not marked in the area -- and that they should be careful. The group was in contact with Meckfessel in Sulaimaniya until about 1:30 p.m. Friday, when they reported they were "surrounded by Iranian soldiers," Ahmed said. No further communication was received. Mohammed, of the Nirwan Hotel, told CNN that the hikers said they had come to the area because they heard it was safe, saying they were considering a trip to Ahmed Awa. But, he said, he advised them against it. "I warned them many times," Mohammed told CNN. "When they told me that they are planning to go to Ahmed Awa, I told them, 'Don't go there because it is unsafe for you because you're American and Ahmed Awa is very close to the Iranian border,'" he said. Meckfessel left the hotel about 4:30 p.m., Mohammed said, asking him to take care of their luggage and saying he would not return. Later, he said, Sulaimaniya security forces took the luggage from the hotel. CNN's Arwa Damon and Susan Candiotti contributed to this report.